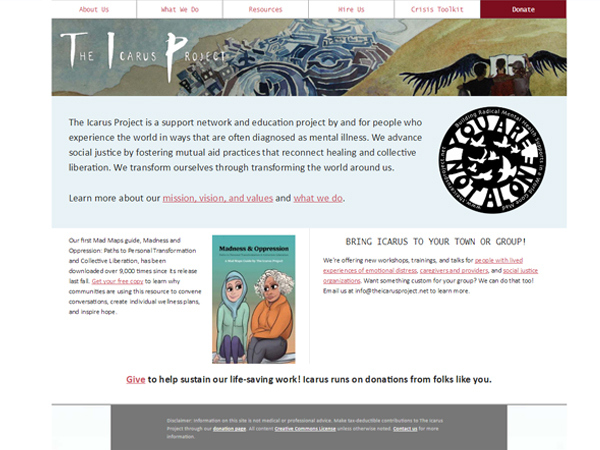 The Icarus Project aims to develop a new kind of society. They have a novel vision with them and they want to transform the world with it. The Icarus Project is manned and run by people who have been diagnosed with some sort of mental illness. Their effort is to change the perception of the world by showing that what is perceived as mental illness is just another way of looking at the world and if recognized as such would enrich it manifold. They are determined to change the world which lives largely by tags, labels and nominations. The challenge was to build a site which brought the vision of the Team to a living reality. The site had to look and feel in a manner which was totally compatible with the mission and vision of the people behind it. Totally in sync with the aim and purpose of the group, the site had to be interactive, inviting and informing. The Project shares its experiences with Mental health providers and tries to bridge the gap between those who give and those who take therapeutic treatment. A very creative and evocative site which brought to bear the echoes of the team’s aims, vision and purpose. The Site clearly brings to focus the core philosophy of the team and also makes aware of the fundamental team itself. In a lithe and concise manner it lays bare the values of the project and invites people to reach out and participate.